Cupcakes 'n Daisies: And Then . . .
10 teenie weenie itsy bitsy ridiculously cute mini cake stand basket blocks. I'm not tired of making these blocks, yet! 10 down 20 more to go. 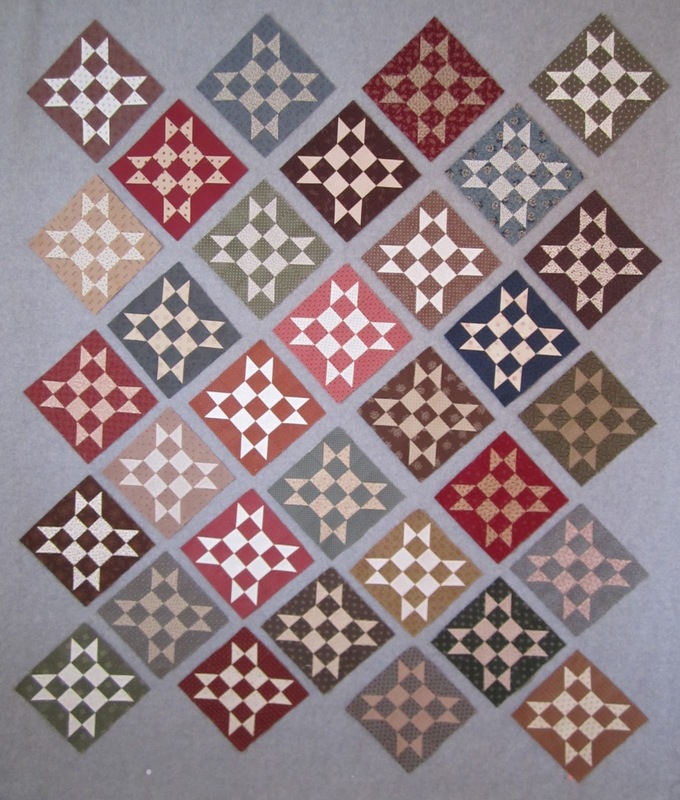 I've decided to go with 32 Sister's Choice blocks for Not Jubilee Celebration, these 32 blocks. I think I made 35, 3 didn't make the final cut. I like the looks, variation and shading of these blocks. It's amazing how much I can accomplish with days of 14 hours of sewing time. Now I'm working on the sashing. I hope to have that sashing done and on those blocks by Friday, should be a piece of cake. I recommend this retreat at home thing, now if I could just come up with the perfect name for it, besides great. My hubby is out of town today through Friday and my plans are the same as yours, except there may be a brief trip to the quilt shop! I just love these baskets blocks!!!! How about a sewcation....Enjoy yourself. I think it is called "retirement"... Which I hope to do before year end. Love those mini cake blocks. Did you unplug the phone? I keep getting recorded messages or real estate agents etc. phoning and disturbing my sewing all the time. I just let a lot of them go to voice mail but it's still annoying. How big will the Sister's Choice end up? It's quite nice. I'm jealous! I won't list what I've been doing bc that would sound like whining, but I will tell you that I havent sewed for almost three weeks now. Could I send you my four kids and then I could sew? LOL Have a great week. Ah yes, that's what I'm talk'n about. Enjoy! That sounds wonderful! Love the teeny tiny blocks! 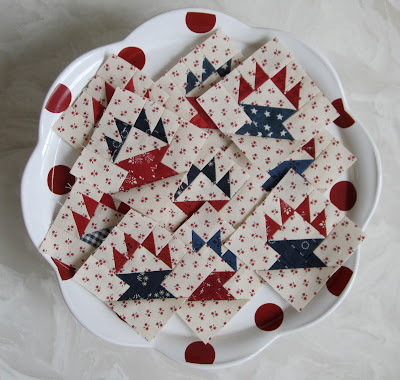 What darling little cake stand blocks!! 14 hours to sew... sounds marvelous!! I love the "sewcation" name from above. I think I will join you. My daughter is headed out for a four day weekend with friends, so just me and the cat! Thelma, your "sewcation" sounds terrific! 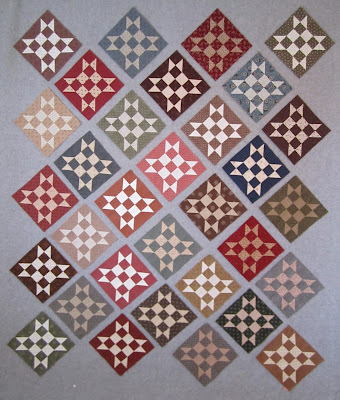 I love your teensy little cake blocks, and your Not Jubilee blocks are also beautiful. Your cake stand blocks are adorable in the red, white, and blue fabrics! Sewcations are essential to our creativity and our sanity, whether they are a day long, or a week long! Just think, if you didn't have to walk the dog, you could stay in your jammies all day! Long live Lean Cuisines! Sounds like a great personal retreat to me! Your mini blocks are adorable. I've caught up with mine too. And the Sister's Choice blocks look fantastic. Have a happy day! Love Tammy's idea of calling it a sewcation. What I wouldn't give for one myself, maybe I should ship the hubbie and boys off somewhere for a weekend. Loving the mini blocks, they are just too cute. The Sister's Choice blocks are fantastic. Looking forward to seeing them all sashed. Thelma, you just described my dream vacation. My summer break will be half over on Saturday (not that I'm counting the days! ), and I haven't gotten nearly as much sewing time as I'd planned. Hopefully I'll spend less time cleaning and organizing and more time stitching during the second half. what tiny blocks! I could use a staycation to just sew the days away. I will have to take (this) Saturday afternoon instead. It's tough with the warmer days and an almost 8 year old to entertain and watch swim in the pool. I haven't been in my sewing room in weeks. I'm missing it. Those are absolutely the most adorable teeny tiny basket blocks I've ever seen and love the colors too!! Good for you - taking time for yourself! Your baskets are adorable in RWB; what a great idea. Love the Sister's Choice blocks, too. Love your quiltcation! I miss having those long lazy weekends where I stayed in tee shirts and elastic-waist pants and sewed until I couldn't see straight any more! Your baby blocks are to die for. Totally my colors! I'm having a "staycation" sewing day today, too. Amazing how much you can get done with no cooking to do! Your Not JC blocks are looking great! After seeing your itty bitty basket blocks I wanted to make some too! I've only made three so far but boy are they cute! As always, you are an inspiration! I love your Not JC blocks and that quilt top is going to be gorgeous, especially with those gorgeous little nine-patches in the sashing. The little basket blocks are ridiculously cute. Oh My Gosh - those little baskets are sooooooooooooooo cute! Sounds perfect! I find to get time on my own I have to leave my house. Too hard to get husband and three kids all out. It'll happen one day, when they're older. Enjoy yourself. There are some who wouldn't understand what a treat it is to have all of that time to sew! Love those little, bitty baskets! Happy Stitching!